On the left side of the screen, select the Application Manager item. If you don’t see this item, choose the General tab from atop the screen. Swipe the list of apps on the right side of the screen until you see the Running heading. You’ss see a list. 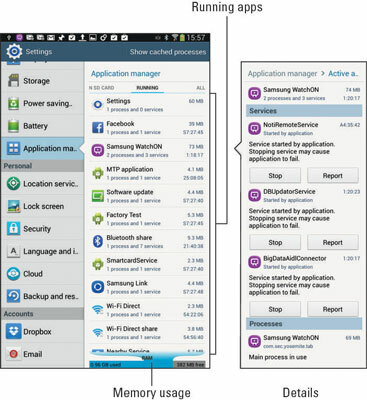 Some of the items are apps currently active on your tablet, such as Samsung WatchON, but others are services, such as the MTP Application. Some apps may even have double entries, showing that the apps are doing more than one thing at a time. Select an app to examine more details. The details break down the app’s usage of the tablet’s resources into an organized list of exhaustive information that few people understand. And now, the shortcut: When you long-press the Home key, you see a list of recent apps. At the bottom of the screen, you’ll find three buttons. The button on the far left accesses the official Task Manager window. Like the Application Manager, it shows running apps, but it also shows an End button next to each app. Choosing an app from the Applications Manager window reveals a Stop button. Like the End button in the Task Manager, you can use the Stop button to halt an app. Even though you can use the End or Stop buttons to halt apps run amok, it is not recommened that you go about and randomly stop apps and services. The end result could render the tablet unstable, requiring you to power off or reset the tablet to regain control.